Children or an adult that hasn’t yet grown up, this is the stilt walker for you. Santa is happy to hand out present’s provided by you. Santa’s little elves have gotten big - After all, someone has to reach the toys on the top shelf! With their curly candy cane hats and red cheeks, these characters will be a memorable part of your day, and are always ready with a wave and a seasonal smile. You can't stop them posing for photographs or causing mischief, so come and enjoy some festive frolics with our Christmas Elves. 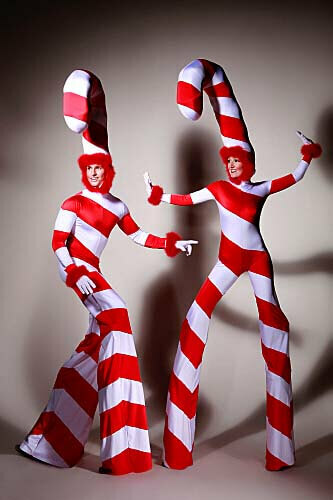 We are very proud to introduce these sweet characters to the Chosen Events family; the sensational Candy Canes. 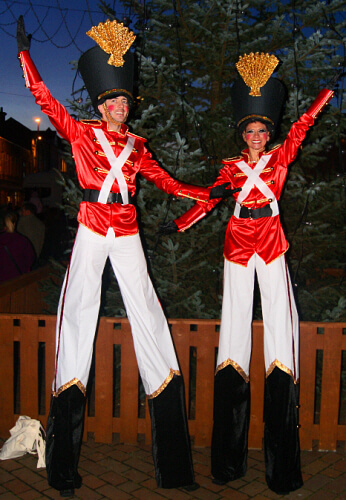 Standing at over 9 feet tall these characters are definitely the most fun way to entertain your guests. 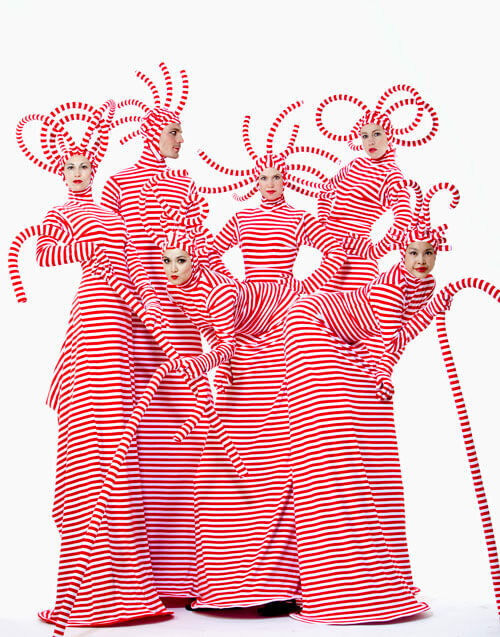 The Curly Candy Stilt walkers come bestowing gifts in the shape of little baby candy canes. 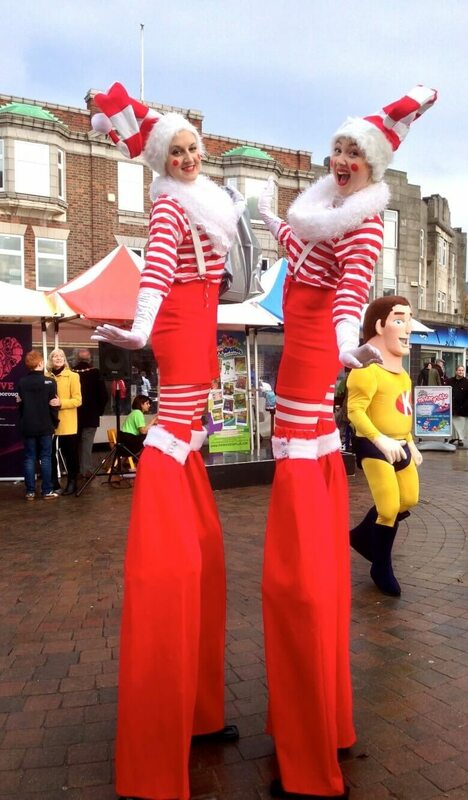 Fabulously outfitted and ready to sprinkle your festive season with joy and sweets these stilt walking crazies are bound to create ripples of joy. Just don't forget to brush your teeth afterwards! These fabulous, traditional Royal Toy Soldiers will help you celebrate the holidays in fabulous style! A must have at any Christmas party, light switch on, parade or Christmas dinner event. They create an impressive doorway, standing to attention, but always happy to break rank pose for photos! Christmas is coming and these traditional chocolate box characters will fill the air with the magic of Christmas. 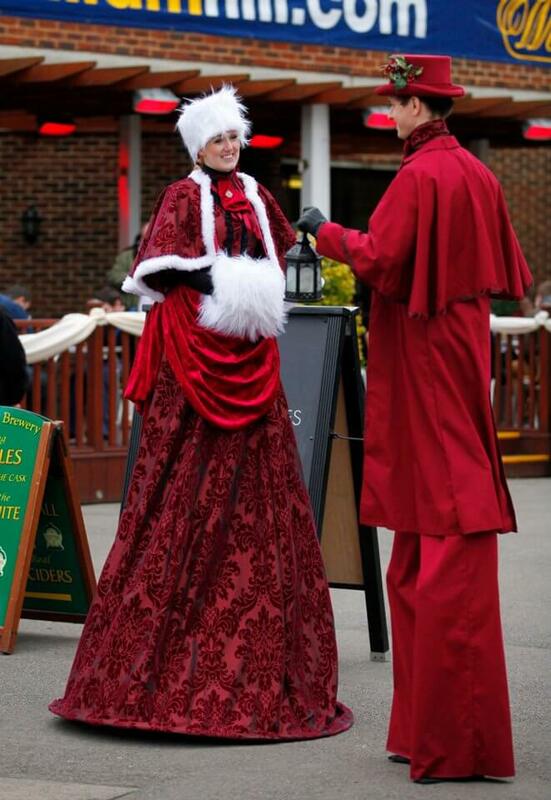 This Dickensian lady and gent dressed in the latest Victorian finery and carrying a lantern to light their path will fill the air with beautiful traditional Christmas music, aided by a hidden mp3 player and speaker. 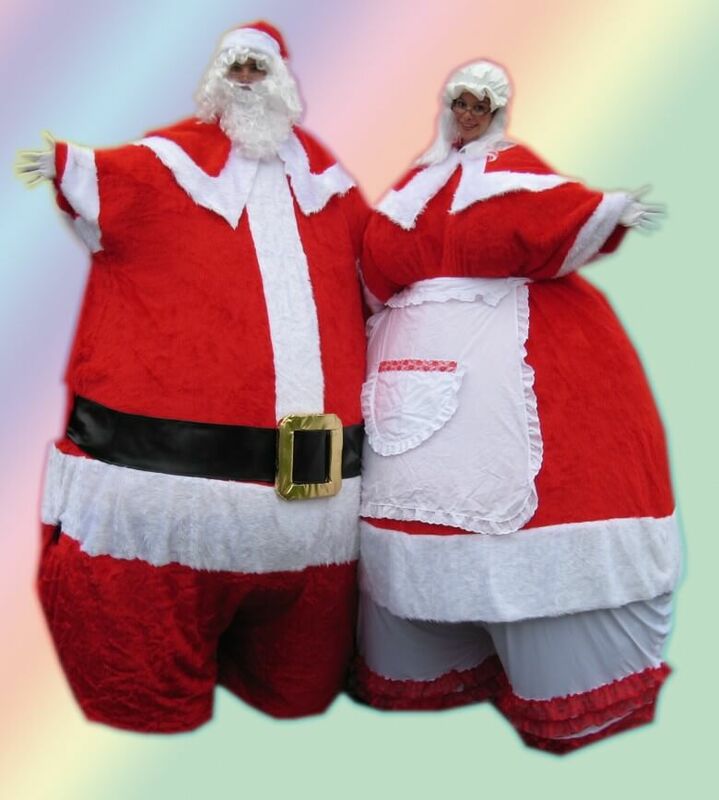 Standing 9 ft, 5 ft wide and squeezing in just under a tonne, Supersize Mr and Mrs Santa make a great double act. Whether they’re checking the naughty and nice list or cutting some serious shapes on the dance floor, these wonderfully interactive loveable characters are just perfect for all Christmas occasions. You might not be able to sit on Santa’s lap, but he may well sit on yours! Here are our Beautiful Bouncing Rabbits. What you can't see is that these characters are on bouncy stilts. 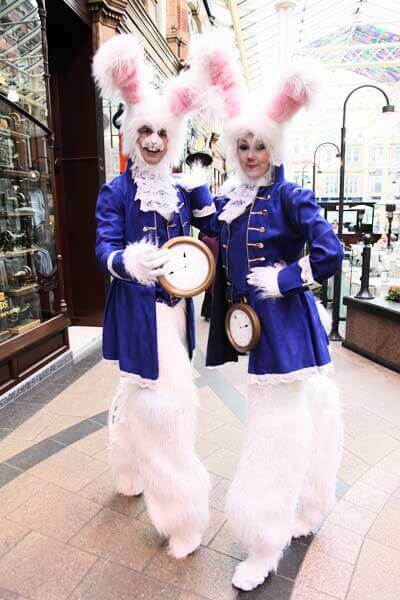 They can hop around your Christmas event and are able to bounce six foot in the air to amaze and amuse your guests. 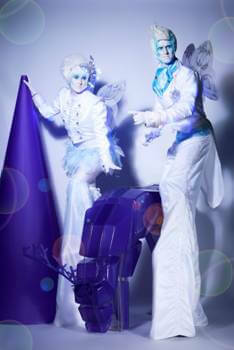 Meet The Human Flowers a pair of spell-binding stilt-walkers bedecked in the most stunning array of silk flowers. Enchant your guests with the most dramatic living flower displays they've ever seen. 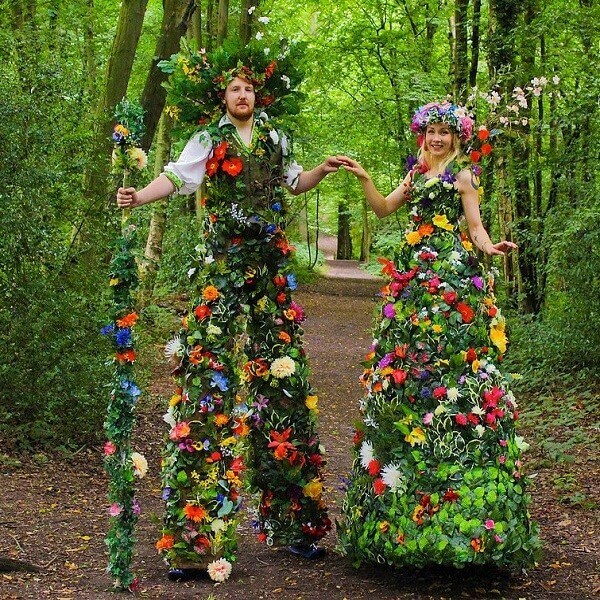 Entirely costumed in scented silk flowers so realistic that people ask if they've been freshly picked, these breathtakingly beautiful Flower Stilt-Walkers will leave your guests spell-bound. Entertainment and decoration combined, these are living, and moving sculptures of flowers, letting you bring nature to indoor venues or a touch of magic to outdoor spaces at your event. These characters takes inspiration from Tim Burton’s classic “Nightmare Before Christmas”. 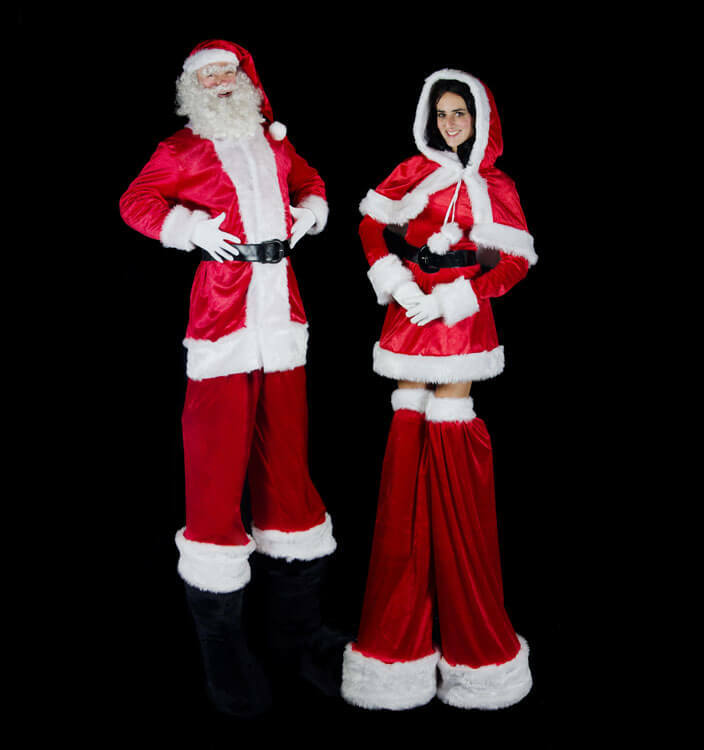 Our Jack Skellington and Sally Finklestein Stilt Walkers are a firm favourite if you require something different for your Christmas event. He can also be accompanied by our own Sally Finklestein. On peg stilts Jack and Sally tower over guests at eight and a half feet tall. Sometimes also likened to Jack Frost, ultra-bright twinkling light filled jackets and accessories which are at their most beautiful out of daylight, albeit still very visible. Also equipped with a hidden mp3 player which activates as they thaw. Available together or can be booked separately.